Christmas Shipping Deadlines – Last Days to Ship for Amazon & Other Retailers! Amazon has been *hot* with all the awesome deals on Christmas gifts but you’ll want to make sure that you don’t end up with extra shipping charges by waiting till the last minute. 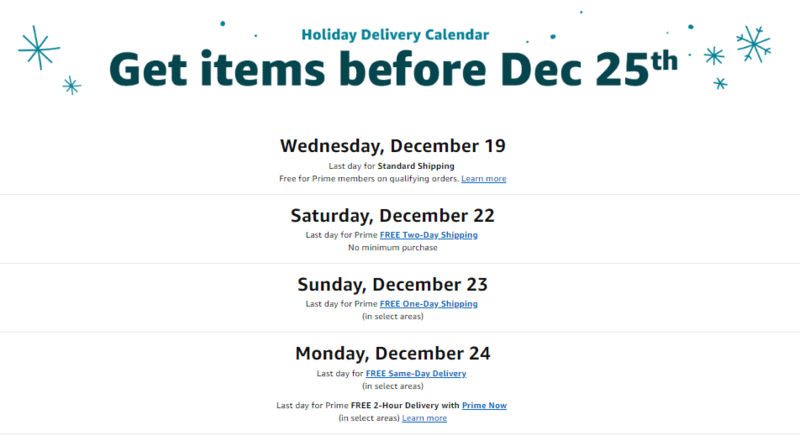 We’ve got the rundown on all the shipping deadlines from Amazon.com. Amazon Gift Cards – You can print these anytime or email them to the recipient for a last-minute or forgotten gift. *These shipping deadlines are based on items that are sold directly from Amazon or fulfilled by Amazon, but I would always confirm on your order what the shipping date will be before your submit your order, so you don’t run into any surprises and have to get a last-minute gift to cover for your gift not arriving on time. Don’t forget that you can sign up for a FREE one month trial of Amazon Prime, if you’d like to get FREE shipping for a month on Prime-eligible items & try out the service. Not only will you get free 2 day shipping on Amazon for Prime-eligible items (or pay $3.99 for 1 day shipping), but you will also be able to get FREE unlimited streaming of 100’s of movies and tv shows on Amazon Instant Video. You will also be able to check out a FREE book a month from eligible titles part of the Amazon Kindle Lending Library. If you then choose to continue with Amazon Prime, it’s $99 for the year. If you decide not to join, make sure to cancel before your month is up or you can go into Your Account on Amazon now & make sure it will not charge you for the Prime membership.